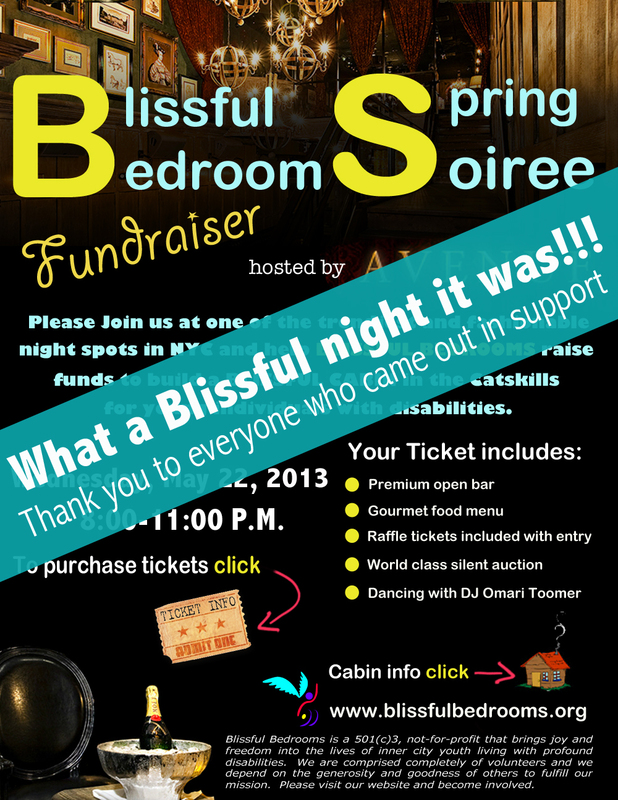 Thank you to EVERYONE who came out to the Blissful Bedrooms Spring Soiree Fundraiser!! The evening was spectacular from start to finish and we didn’t want it to end!! We would like to extend our sincere and heartfelt gratitude to the Blissful Bedrooms volunteer team who collaborated to put this event together – Team Blissful Bedrooms Spring Soiree. They did such an outstanding job of creating a memorable, elegant and incredibly “blissful” event. Who would ever believe in a million years that it was their very first fundraiser. Bravo to you ALL!! A very special shout out and high five to the team leaders – Aaron Gailmor, Meg O’Dwyer, Karin Sagona, Ben Bernstein and Jeff Boyd – who worked relentlessly, for the past several months, planning this gala, doing outreach and recruiting sponsors and support. Thank you for inspiring and igniting the hearts of your friends, family, colleagues, and beautiful strangers to join hands with us and support our efforts to build a Blissful Cabin Retreat in the Catskills for Disabled Youth. As the famous quote by Margaret Mead goes – Never doubt that a small group of thoughtful, committed citizens can change the world. Indeed, it is the only thing that ever has. And last, but definitely not least, enormous gratitude to all of the sophisticated and generous sponsors of our event. Without your sponsorship, this event definitely could not have been the class act that it was! Thank you for backing and believing in our grassroots, humble charity that carries out BIG-hearted and beautiful charitable acts for young individuals with disabilities. Learn more about the Blissful Cabin Retreat in the Catskills Project and make donation to help us manifest it here.